The Moon River Brewing Company was founded on our obsession with creating the ideal restaurant and brewery experience. Striving for this ideal, we are committed to providing three basic services. We are dedicated, first and foremost, to providing you with a comfortable and relaxing environment with prompt and cheerful service. Secondly, we are committed to serving you a delicious variety of freshly prepared foods. Our kitchen is a melting pot of diversity, offering a range of dishes from simple comfort food to eclectic gourmet cuisine. Finally, we are undeniably passionate about serving great beer. 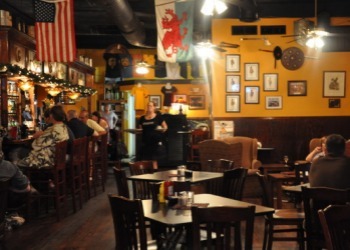 Whether you are new to Savannah or just passing through, you'll find a warm atmosphere and a great selection of food and spirits. We can accommodate groups or a table for two. Either way, Moon River Brewing Company is a great start to a great time. There's a ghost named Toby who appears as a shadow in the billiard room, at the rear of the banquet cellar. "Toby is known to breeze past you or even push you out of the way," Lewis said. "We don't know why he's here, but he likes to play tricks on people." On the third floor, a lady in white has been seen by several people, Lewis said. She was even caught on video when the SciFi Channel ghost hunters were there to track paranormal activities. "At night this is a pretty creepy place. I don't like being here alone," he said, adding that most sighting occur after sundown. 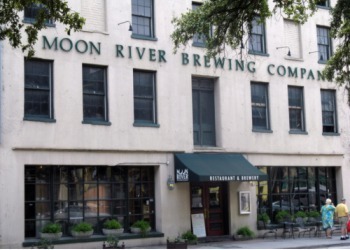 Moon River Brewing Company is located in the former City Hotel. Elazer Early, a native of Charleston, S.C, built the City Hotel in 1821. Not only was it the first hotel in Savannah, but it was also home to the first branch of the United States Post Office in Savannah, as well as a branch of the Bank of the United States. It must have been convenient having a hotel, post office, bank and bar all under one roof! In 1851 Peter Wiltberger bought the City Hotel. He renovated it and put a live lion and lioness on display to draw attention to his business. City Hotel�s final guest checked out in 1864, just before the arrival of General Tecumseh Sherman during the war of Northern Aggression and the subsequent closing of the City Hotel. At the turn of the century, the building was used as a lumber and coal warehouse. As the use of coal slowly died off, the building was used for general storage. In the 1960s the space was renovated as an office supply store, complete with a large printing press. Hurricane David forced this business to close in 1979 when it blew the roof off the structure.